Free Rice for UN World Food Program and Fun for You! I read an article, Word Fun Becomes Feeding Frenzy, in the AZ Republic today about http://www.freerice.com/. I had also heard about this site from our daughter who has played it quite a bit. It is pretty simple and probably easy to get addicted too. It was originally created by a father to help his kids study for the SAT. It is basically pretty simple, the screen displays a multiple choice vocabulary question, answer right and 20 grains of rice get donated to the UN World Food Program. You can keep playing and answering more questions which get harder as you get questions right. After you have answered a few questions, it assigns a starting vocabulary level for you to work upwards from. Apparently the highest level is 60 and not too many people make that. Will you be one of them? In the Options section you can select to save your total and vocabulary level from one session to the next. The rice gets distributed in countries like Myanmar, Bangladesh, and Uganda. The site’s sponsors pay for the rice. 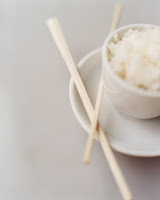 20 grains of rice may not seem like a lot but it adds up quickly. Just yesterday over 75 million grains of rice were donated through this program. There is a lot more information on the FAQ button on the http://www.freerice.com/ website. One Response to "Free Rice for UN World Food Program and Fun for You!"